Dogs can adjust to navigating around the house using their senses of smell, touch, and hearing, which all become elevated when they lose their sight. Use scent markers and mats with different textures to mark doorways or obstacles the dog could bump into. And you may want to block off any stairs in your house or yard, at least initially. 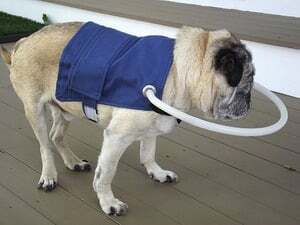 A hoop and harness can help keep blind dogs from bumping into objects. It’s up to you to help your blind dog learn the layout of your house. Dawn Rehus, a certified pet training instructor, recommends first leading your blind dog through the house on a loose leash. “Tension should only be applied if the dog is heading into danger. Most people are surprised how little this happens – their instincts can be amazing,” she says. If your dog is having a lot of difficulty getting around, Karen Belfi, president of the Blind Dog Rescue Alliance, recommends building a hoop and harness. The hoop goes around the front of the head and will let the dog know when he is about to bump into an obstacle so that he can turn and avoid a collision. Sometimes, dogs can have trouble locating their water bowl. If you find that this is the case with your dog, there are plenty of dog bowl water fountains on the market that you can try. Your dog will be able to hear the water, leading him to his bowl. “Be sure it is for drinkable water, and not a decorative fountain, however,” Belfi warns. Why do dogs go blind?